When you play poker, you have to navigate different types of situations, both before and after the flop. Sometimes, you have a made hand and your biggest concerns are extracting the maximum value from your opponents. Generally speaking, these situations are easier to play and more clear-cut. However, more often you’ll end up flopping a draw or a semi-draw, i.e. a hand with a potential to become a likely winner but with very little or no value as it stands. So, you know that you need to either hit one of your cards or make your opponent fold before the showdown if you are to win the pot. Since draws are so common in Texas Hold’em, this article will discuss the strategy for playing it at length. We’ll cover many of the important considerations, such as the difference between playing in and out of position, when you should turn up the heat, what draws are and aren’t worth chasing, and more. After reading this, you should be able to improve your results in these types of situations and have a much better idea of what to do in difficult spots. One of the biggest mistakes novice players tend to make is failing to realize that there are significant differences between various draws you can hit on the flop and/or on the turn. Ideally, you only want to chase draws that are likely to be good if you hit your „gin“ card. Chasing after draws that end up making you the second-best hand can be a very expensive mistake indeed. Of course, these are some general considerations. There are situations where it makes perfect sense to chase non-nut draws if your opponent’s hand range is such that they’re unlikely to have a better hand if you get there. However, when things get tricky, you should be very careful about chasing after a draw that could likely be the second best hand. Likewise, you need to make sure your direct or implied odds warrant making a call in a draw-type situation. Players can often get too attached to a hand such as an open-ended straight draw but these are only worth pursuing if your opponent gives you the right odds and/or if they have enough chips behind that you’ll be able to get them to commit if you make your hand. Like pretty much everything else in poker, you’ll have it much easier with your draws when you’re the one in position. Even if your opponent has the betting lead, you’ll have some control over what happens in the hand because you get to act last. Furthermore, since they don’t know your exact hand, they’ll often make a mistake in their bet sizing allowing you to realize your equity. So, in general, when you’re in position, you can afford to play your draws more passively, especially when you have a non-nut draw. While raising has its merits as it gives you more chances to win the pot, it also leaves you open to 3-bets, which can be very tricky to handle if you’re not drawing to the nuts. 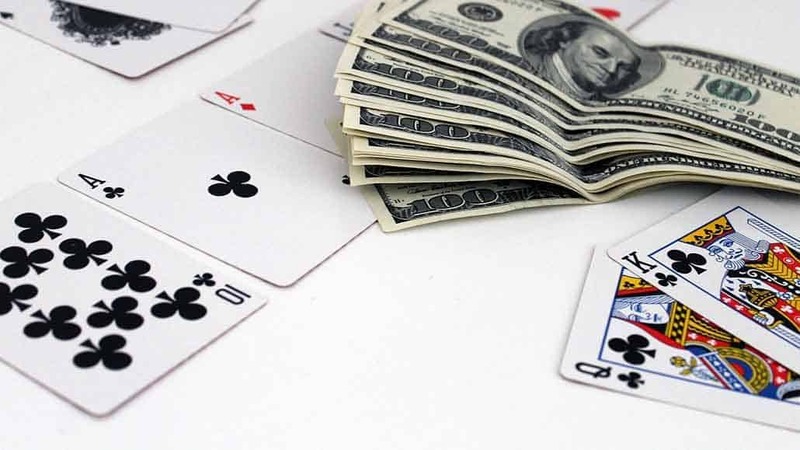 On top of that, you will most likely be calling a big part of your other poker hands such as one pair, so having some flush draws to protect your range is a good idea. 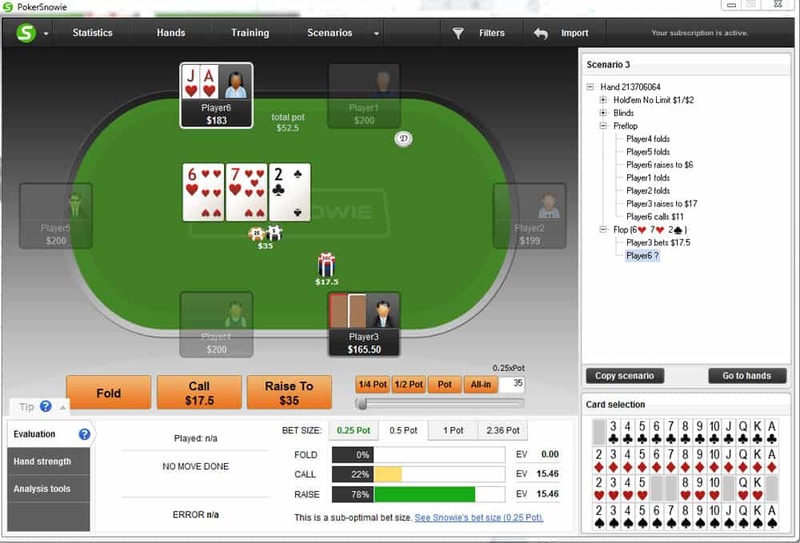 In this spot, PokerSnowie suggests that simply calling in position has somewhat higher EV than raising. Although raising could get the opponent to fold some hands that are in front (like some Ace high hands, for example), it would also give him a chance to move us off our hand and deny us our equity. One exception to this would be if your Hold’em Manager suggested that your opponent has a very high c-bet frequency in these spots, where you might want to raise and pick up the pot right away, not allowing them to see another card and improve. In the same spot but if we exchange the Q♥ for A♥, PokerSnowie actually suggests raising well over 70% of the time. Although the expected value of both plays (calling and raising) is identical, the fact we have a draw to the nuts is what makes the case for playing the hand in a more aggressive way. With us having the nut flush draw, we know the opponent can’t have that particular draw, so it gives us much more freedom and confidence. Additionally, taking control in the hand here could give us the opportunity to check back on the turn and see the river for free, if we decide the opponent’s hand seems too strong and they’re unlikely to fold to a turn barrel. That way, we give ourselves a chance to realize the equity in the situation where a passive approach might lead us into a position where we’re forced to fold to a big turn bet. Having to deal with draws out of position can be a much trickier business. Since we have the disadvantage of always being first to act, taking an aggressive route more often is warranted. The aggression can help compensate for the positional handicap and make your opponent’s life more difficult even if they have a fairly strong hand in absolute terms. We decided to make a standard open with 10♦ 9♦ and the opponent in the button made a very small 3-bet. This allows us to make the call and see the flop profitably. The flop produces an open-ended straight draw as well as a backdoor flush draw so we hit pretty well. 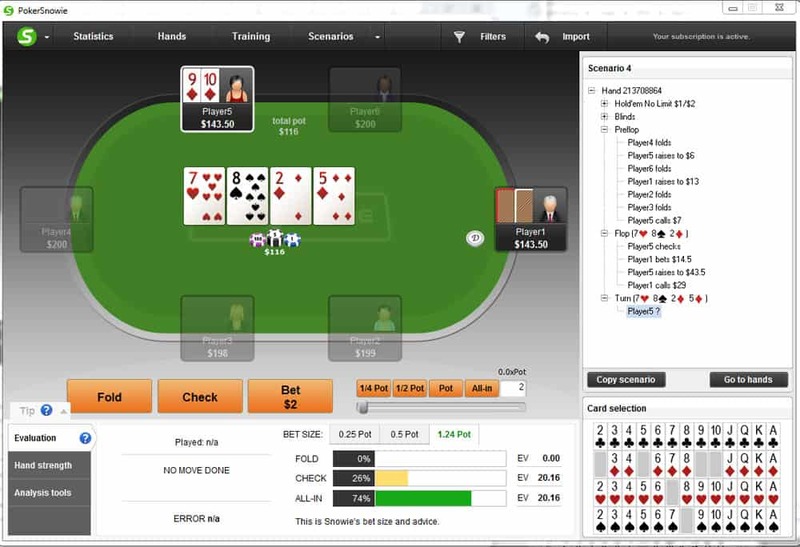 Playing in the flow, we check to our opponent, who proceeds to make a continuation bet of half the pot. 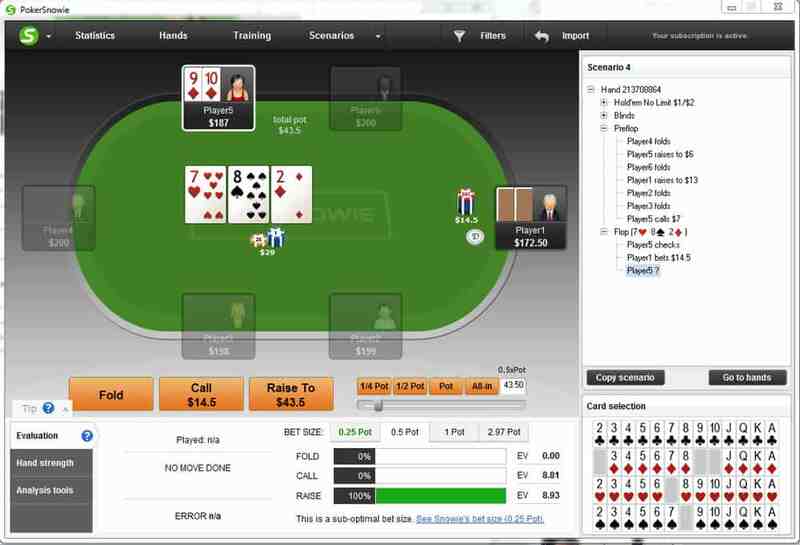 In this situation, making a raise of about half the pot is actually a more +EV play. It puts the button player in a difficult spot because they should know that their small preflop sizing allowed us to enter with a wide variety of hands, which connect pretty well with this flop. Although we don’t have a made hand yet, by playing aggressively, we’ll make it very hard for them to continue unless they have a big pocket pair, and some players might even find a fold with a hand like pocket pairs here. The turn comes 5d, giving us additional equity and our best move here is to move all in. Although it is an over-bet in relation to the size of the pot, it really looks strong and puts a lot of pressure on the opponent. We’d probably play our two-pair hands and sets in a similar fashion. Additionally, with 5d hitting the turn, there are already made straights. While we would be much more willing to take a lesser-variance approach with this hand in position, being out of position means we have to mix things up and somehow compensate for the inherent disadvantage. Being aggressive in spots such as this one is an excellent way to do this and keep your opponents on their toes. Of course, you shouldn’t play all of your draws super-agro 100% of the time when out of position. If you do that, you’ll become predictable and observant players will adjust. As always, your poker strategy needs to be mixed up so that you have a fair amount of strong hands and draws in this spot when you both just call and raise. That way, it will be virtually impossible to figure out if you’re betting for value or on a bluff and poker tools such as tracking software can help you make the right decision based on the stats you have, thus make sure to grab a free trial if you do not have it yet. The most important takeaway from this article is that you need to always look for ways to make big draws work for you, whether in or out of position. Waiting for the right card to hit to start getting aggressive may be the “safest” approach but it isn’t always the right one. Good drawing hands get a lot of their power from the fact you can ramp up the aggression knowing that, no matter what, you aren’t drawing dead. On the other hand, mediocre draws are the ones to be played more conservatively as they can often get you in trouble. Playing draws in Texas Hold’em is really a broad topic so there is much more to say about it. However, this article tries to at least scratch the surface and give you some pointers on where to start. With these basic ideas in mind, you can further build your game-plan for similar situations and adjust your play as you go along. If you want to dig deeper into advanced poker strategy, learn more about playing draws, check-raising, bluffing and other vital concepts, you can always check out my complete training program “Poker Formula For Success” and make your life even easier at the tables!